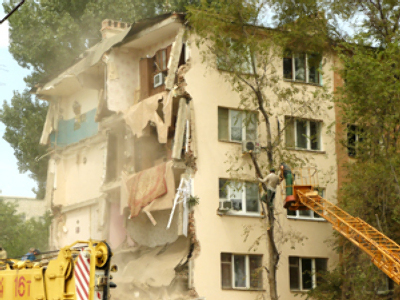 The three remaining bodies of those killed in a residential building collapse in the southern Russian city of Astrakhan have been removed from the rubble. Two other bodies were dragged out earlier in the week. The officials say the bodies of all those missing following Wednesday’s collapse have now been found. "There is only rubbish, which we plan to take away in the near future. Presumably, there are no more victims under the remaining debris," a local emergencies spokesperson told RIA. All-in-all, twenty-five flats have been ruined in the accident. The building belonged to a local factory and was used to house workers and their families. Prosecutors have launched two criminal cases, saying the building, constructed in the 1970s, was recognized as a structure under threat of collapse twelve years ago.